These 3 exercises target all areas of your midsection with precision and efficiency. Possessing a pretty impressive set of abs himself, Brian Peeler knows what it takes to get one. As an NASM-certified personal trainer, Peeler doesn't burden his clients with endless circuits of fancy ab exercises. 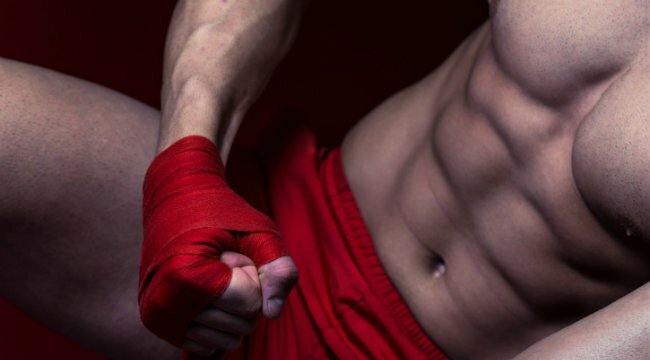 Rock-solid, six-pack abs, while still mainly a byproduct of a great diet, can be had in only three moves. The upper abs are targeted by way of the cable crunch—a resistance-laden move that provides a new challenge for stubborn abdominals. Peeler then has clients move into the hanging leg raise, which is more on the side of advanced, but can help to zero in on lower abs, a problem area for most gym rats. Finally, Swiss ball side crunches provide a way for his clients to introduce a bit of instability to target not only their obliques but their entire core musculature. Use his trifecta once or twice per week to start building deeply-etched abdominals. Perform this workout in circuit fashion, doing one set of each exercise listed in succession before resting one minute and repeating it twice more. If you choose to perform the routine in straight sets, simply alternate the order of exercises from workout to workout. Start: Hook a rope attachment to a high pulley at a cable station. Grab the handles and hold them near the sides of your head. Descend to your knees, your thighs perpendicular to the floor. Tilt forward at your hips 30-45 degrees. Execution: Keeping your head neutral and upper body rigid, contract your abs as you would during a crunch, bringing your face toward the floor. Stop just short of the floor, squeeze your abs and slowly return to the start position. Start: Reach up and grasp a pull-up bar with a shoulder-width, pronated grip and your eyes forward. (If you have shoulder problems, you can use arm straps at your elbows). Execution: Keeping your toes pointed and legs as straight as possible, contract your lower abs to initiate the movement. Roll your hips upward to bring your legs up to a point just past parallel to the floor. Hold the top position for 1-2 seconds, then slowly lower your legs back to the start position. A descent too rapid will invite momentum into the movement, decreasing its effectiveness. Start: Sit on a Swiss ball, walk your feet forward, then lean back until you are lying back on the ball. With your feet shoulder width apart, put your right hand at the right side of your head and put your left hand on your right obliques. Slowly roll your body toward your left until the outside of your left foot and the inside of your right foot are touching the ground. Try to spread your legs so your feet are slightly more than shoulder width apart, your upper body positioned as it would be in a traditional side crunch. Execution: Crunch your upper body toward the hip that is facing up. Squeeze at the top for a count before returning to the start position. Once you are comfortable with the movement, you can allow your body to curl past parallel on the negative to provide an even greater stretch on your obliques. Complete all reps for one side, then switch sides and repeat.